Small town in the district of Dorogoi, Rumania. It was formerly called Vladeni and Tirgu-Nou, and was founded in 1792 by a number of Jews under an agreement with the proprietor of the domain. This agreement was confirmed by a decree of Prince Alexander Constantine Moruzi, dated May 30 of the same year. Besides certain personal advantages, the founders obtained the right to use gratuitously the grounds necessary for a synagogue, a bath, and a cemetery. When the town came into the possession of Prince Michel Sturza in 1835, he made it the capital of the district of Dorogoi. Actuated by a desire to change the terms of the original agreement, he persecuted the inhabitants, especially the Jews, cruelly beating one of their leading men and imprisoning his son. Later, however, a law was enacted under which all artisans who should settle in the city were to be exempt for five years from the payment of rent for property held by emphyteusis. The law of 1838, framed by a commission which included seven representatives of the Jewish community, provided that the large synagogue and two small ones, an oratory, and the bath should be exempt from rent. Because of such measures the Jewish population gradually increased. The number of Jewish taxpayers increased from 60 in 1803 to 129 in 1820; the census of 1831 reported 747 Jews and 72 Christians; and that of 1859 showed 2,472Jews and 1,812 Christians. 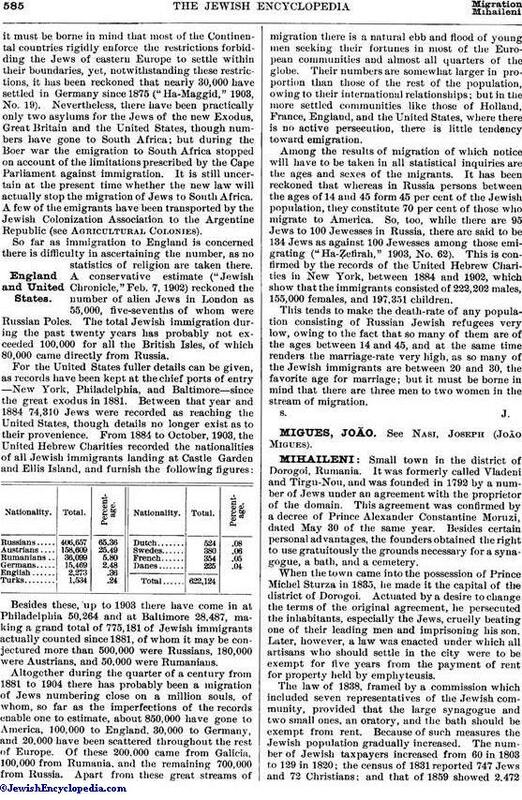 The Jewish population reached its maximum in 1886, when there were 2,855 Jews as compared with 1,075 Christians. The city was, however, neglected by the authorities, and began to decline. In spite of an excess of births and the fact that many Jews expelled from neighboring villages took refuge in Mihaileni, the number of Jews continued to diminish. 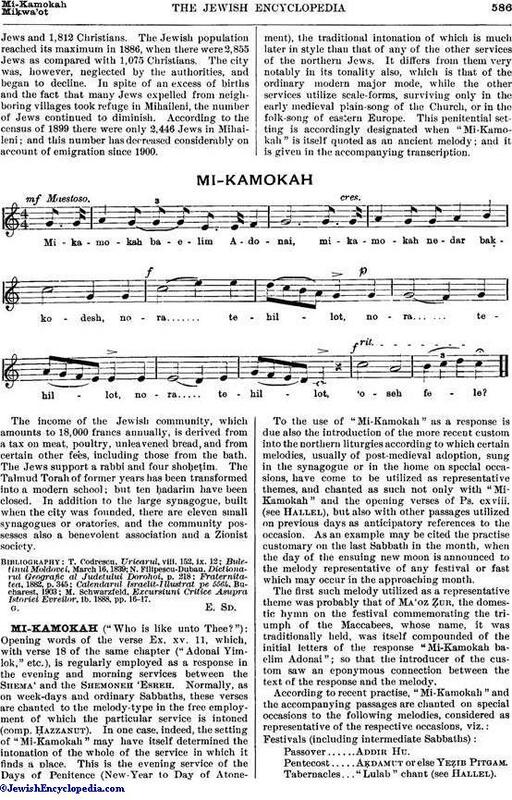 According to the census of 1899 there were only 2,446 Jews in Mihaileni; and this number has decreased considerably on account of emigration since 1900. The income of the Jewish community, which amounts to 18,000 francs annually, is derived from a tax on meat, poultry, unleavened bread, and from certain other fees, including those from the bath. The Jews support a rabbi and four shoḥeṭim. The Talmud Torah of former years has been transformed into a modern school; but ten ḥadarim have been closed. In addition to the large synagogue, built when the city was founded, there are eleven small synagogues or oratories, and the community possesses also a benevolent association and a Zionist society. M. Schwarzfeld, Excursiuni Critice Asupra Istoriei Evreilor, ib. 1888, pp. 16-17.